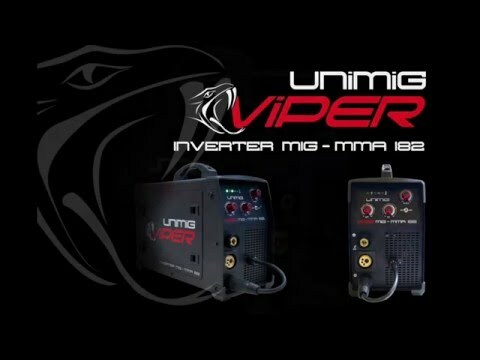 The VIPER MIG182 is a new inverter-based portable MIG welding machine with added MMA function. 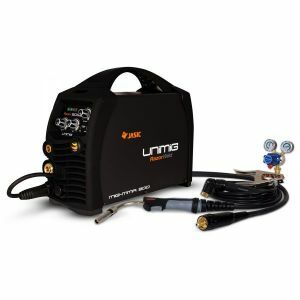 The MIG function allows you to weld with both Gas Shielded and Gas-less wire applications. 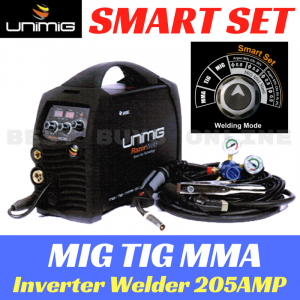 Easy step-less adjustment of voltage and wire feed make for easy setting of welding parameters giving excellent welding results. Wire Inch gives easy feeding of the wire during set up without gas wastage and the Burn Back adjustment leaves the wire out ready for the next weld. Being 240v single phase gives great versatility. deal for DIY and home workshop. Designed and built to UNIMIG's specification. Certified to - AS/NZ60974-1. MACHINE PACKAGE: VIPER MIG 182, SB15 3M Sure Grip MIG Torch, UNI-FLAME Twin Gauge Argon Regulator, 2M Gas Hose Complete with fittings.